Of all the crazy things to happen in the world, this is one that I never would have imagined. 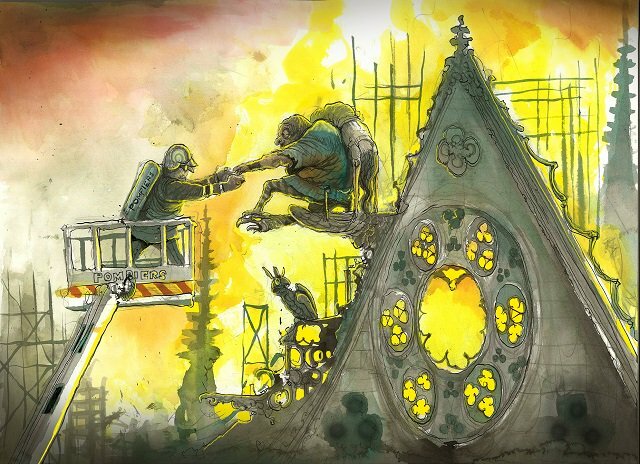 The Notre Dame cathedral could survive the revolution, Napoleon and the nazis but not a roof renovation. Strange days indeed. I did get to visit the cathedral many moons ago and got to go up one of the towers. While everyone was impressed by the rose windows and the magnificence of the architecture, this serpent's obsession was the gorgeous gargoyles. I took loads of photos of them but in those ancient days you had to go to a store to get them developed and printed. And now I realize that I have no idea where those pictures have gotten to. I barely lurk in Cyberia at all these days. Not even on Twitter. 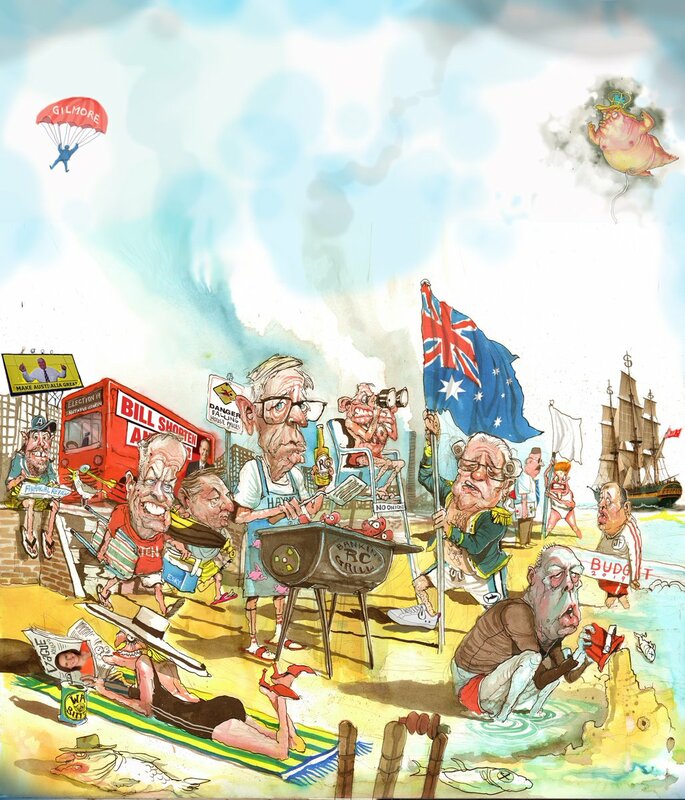 Even then it is usually to catch up on and of course snaffle the latest David Rowe masterpiece. On Friday I went on a grand adventure to the outer suburbs in search of a community nursery because this is the time of year for planting. Recently they held a workshop on how to attract wildlife to you your garden and to basically turn your little patch into a paradise for critters. So Izzie was of course all ears especially as the event was free. Of course there is no such thing as a free lunch. Some one always has to pay the piper but I like an organisation that thinks this is the sort of thing to sponsor. I loved their place and their devotion to all things green and gorgeous but had one giant problem. There is no way that I would ever sign up for membership of a mob that calls itself “Men of the Trees” because the name itself declares that I am simply not welcome. Then there is the not so minor matter that most of the men I know cannot even think of a tree without reaching for a chainsaw. It was just over 4 weeks ago when I attended an antiques auction on a mission to rescue some of Petunia’s precious possessions which miserable grinch Vernon Dursley was too mean to even offer to any of his offspring. 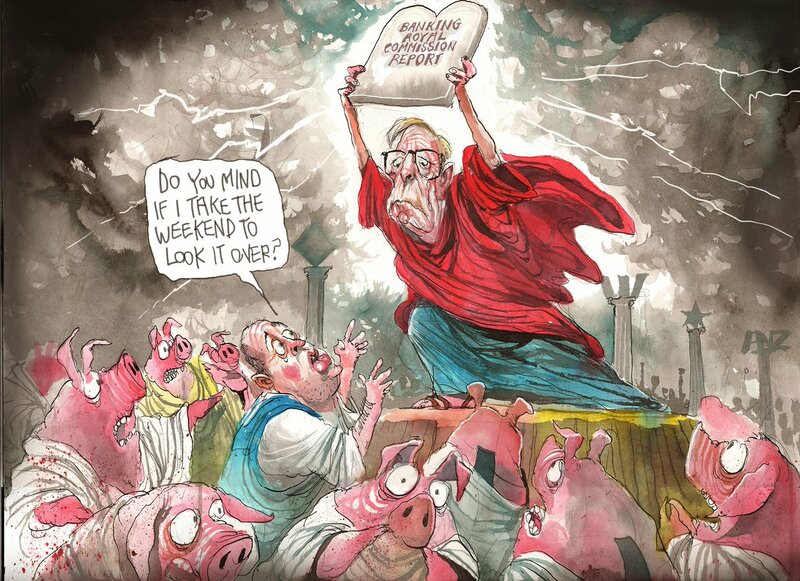 Too brain dead for proper posts but there is always David Rowe to scare away the last day of the month. It has taken a while for me to notice his fondness for plagiarizing famous works of art, advertisements or even historical cartoons. No wonder he is able to come up with such amazing cartoons so quickly. By the time this serpent gets around to posting anything these days, they are already fish and chips wrappers. Obviously by the time you are in the 500 zone the cash register goes ka-ching with a big fat 50 something coins every ten days just for showing up. But they stopped doing that way back when I had clocked up 400 days straight. This year for the first time ever I passed the 30 mark. But due to all sorts of chaos and craziness, I never did manage to post about a single one of them. So what better excuse is there than the usual congruence of days and dates in February and March to indulge in a little trip down memory lane. Next year will be one of those pesky leap years but this one was not so this is the perfect occasion to remember Saturday 9th February. Today was a seriously busy day. After 2 days of lurking and slinking at Borgin and Burkes eying up the territory and the Enemy, today was the big day. I had been drawing up the battle plans because auctions are infamous pits of quicksand for those who do not have their reason and wits about them. The Freaky Fringe is over and dearest Dudley Dursley has flown back home leaving me with the Lair all to myself again. So so glad not to have such sneering judgemental creatures lurking around anymore. This February like last is quickly becoming a giant blur. Due to so many distractions, been neglecting the all important rituals of filing up the Pensieve with memories to be sorted at a later date. The little green note books do not quite count since it is so difficult to search them at a later date. Memories stored in there rapidly degenerate into indecipherable scrawls. Ever in search of distractions, I got a black book of Edgar Allen Poe stories from the city library. It's homework for a decadent second adventure in the old Girls school next Wednesday. Loved the first trip there so much that I am going back for second helpings and hopefully there will be no distractions this time from a proper review of assorted gory details in this very spooky haunted location. Of course I could simply download a selection of stories from the Gutenburg site which I did but for some reason I find ebooks just so much more distracting and harder to concentrate when reading unlike the old fashioned paper incarnations. Today was also the annual ritual of the visit to the Writer's Festival. It used to run for 3 days but due to budget cuts is now down to 2 and due to other commitments I made it to only one of the days. Main attraction was to see the guest speaker Eddie Wu who is most famous as a maths teacher and looks barely older than 18. Apparently he is old enough to have 3 children of his own so I guess he must be really 28 or so. It was strange how long forgotten chunks of last February just came back again today by being in the same place. The stand out guests of last year's festival was a Saudi woman Manal Al Sharif campaigning for the right for women to drive in her home country and Charles Massey the farmer who had written a book "The Call of the Reed Warbler" about how old farming practices have trashed the land and how listening to the land and the local Aboriginal people may offer a more productive and holistic form of farm and land management. It's taken the settlers 230 years and some horrendous incidents of dead fish to realise that they really have stuffed up and to admit that they don't have all the answers after all. The other distraction is Duolingo. I have been corrupted by the Cat and got tempted to game the system after recently updating but only the bare minimum necessary. I am now just 4 lessons away from an all green Russian tree with no short cuts at all (I saved all those for the purple patches en Español). Mind you the segments on politics were suspiciously like a Russian election where nearly half the ballots were already prefilled. Next goal is to go from all green to all red. So the party is over. No more Fringe bingeing for the rest of the year. It’s the most wonderful time of the year. Not miserable grumpy Grinchmas but the Fringe Festival where inner freaks get unleashed and the inner muse does not go out on family friendly creative dates but puts on the red lights and high heels and gets well and truly LAID. Put another blowfish on the barbie. Mate.